This year you can fly from Austria and Germany to Lesvos island directly via Eurowings. The flights start from 02 May 17 and they will be until 24 Okt 17. The Eurowings flights from Austria will take place from Vienna Airport (VIE). These flights will be non-stop flights and the duration for each flight will be approximately two hours and 15 minutes. Usually Eurowings fly from Viena to Lesvos – Mytilene one time per week. The cost for each flight starts from 29,99* €. 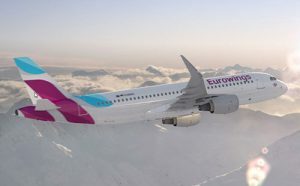 About Eurowings flights From Germany to Lesvos, they will be available from Cologne-Born airport (CGN), from Dusseldorf airport (DUS) and from Hamburg airport (HAM). These flights are with connection and they will take place one time per week. The cost for each route from Cologne-Bohh (CNS) or Dusseldorf (DUS) or Hamdurg (HAM) to Lesvos – Mytilene (MJT) is from 89,99* €. The Eurowings airline is a newly established, independent low-cost airline modelled on its successful partner Germanwings. Eurowings promises to fly you safely and comfortably to Lesvos island in a affordable price – always with the usual high product quality of the Lufthansa Group. Now it is more easy than ever to get at famous Lesvos island from Austria or Germany, to discover the beauty of this island and the hospitallity of their people. Book now and get advantage of our offers!